We can arrange campervan insurance cover for all types of camper vans from DIY Self Build conversions, to purpose built VW campers by Westfalia. We can do Japanese imports such as Mazda Bongos regardless of whether they came out of the Mazda factory as camper vans or were imported as an MPV and converted by one of the growing number of professional specialist camper converters. If you have one of these campers or are planning to buy or convert one yourself why not give us a try for your insurance, it only takes a few minutes and you could join the fast growing Caravanwise client base who are pleasantly surprised. 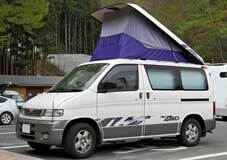 One of the benefits of a smaller campervan over a coach-built motorhome is their versatility. These smaller vehicles can be used every day for shopping and travelling to work as well as for longer trips to all of those places you have always intended to visit but not got around to. Our insurance can cover all of these situations. We can include commuting cover for most occupations and for many there is little additional charge for this. Our policy is a limited mileage policy, with a maximum mileage of 12,000 miles. Research shows that the vast majority of motorhomes and camper vans in fact do less than 6,000 miles a year. Just look at 10 year old vehicles for sale with mileages in the 50 or 60,000 mile range to see the truth in this one. If you are going to use your camper as a daily vehicle and 12,000 miles is not going to be enough then this is not the policy for you. We can't advise you on this, only you will know. Limited Mileage for generous premium savings. The maximum mileage is 12,000 miles, but you can of course make a saving from generous discounts offered by the insurer if you select a lower limit to mileage. The limit that you select will be shown on your proposal form and schedule of insurance. You can choose any level from 1,000 to 12,000 miles. If you find during your term of insurance that you find you are covering more miles, you must inform us of this as soon as possible and for a small additional premium we can adjust your policy up to a maximum of 12,000 miles. At renewal, we will re-quote your annual premium at the higher mileage, giving you the chance to review this. Campervan insurance that can include commuting to and from work. Camping equipment, awnings and gas bottles are automatically cover for up to £3,500. European Cover: The cover you select is extended to include EU member states and associates such as Norway and Switzerland for up to 180 days. You don't need to tell us when you are going to the EU as cover is automatically included. Trailer towing is included. This provides liability cover for a trailer or caravan. It does not cover you for losses to the trailer such as accidental damage or theft, for that you need trailer or caravan insurance. Generous discounts for limited mileage. Third party fire and theft cover available for vehicles up to £5,000 in value. Older vehicles, even up to 100 years old, covered. Insurers recognise that many campervan and motor caravan drivers are more experienced, and take more care than the average driver. As a campervan owner you are not only a more careful and considerate driver, you are also more likely to be aware of security precautions. You therefore deserve a lower premium. Our premiums take many factors into account, including where you live, your age, driving experience and the mileage that you plan to do in your camper van. You can obtain a personalised and competitive quote by using our online quote system or by phoning our office on 0800 3282084 during office hours. Because Highway is part of LV= you get access to LV's award winning 24 hours a day 365 days a year, UK based, claims team. This gives you fast access where appropriate to Approved Repairers, Vehicle Recovery in the event of an accident, and Windscreen replacement. Approved repairers are often not suitable for larger motorhomes and campervans and you have the option to get quotes for many repairs from a motorhome specialist and submit this to Highway for approval. When you buy a policy arranged direct by Caravanwise you know that you are getting a good deal and if you are ever in the unfortunate position of having to make a claim you will come to appreciate the real value of a policy underwritten by a major motor insurer. We can arrange cover for any mainstream, original manufacturer, UK or European manufactured motorhomes and campervans including VW and Hymer. We can arrange cover for many imported motorhomes including Japanese campervans and some American motorhomes, provided they fit the other limits of engine size, number of seats, value etc. Cover can also be arranged for professionally converted vans as well as for self build conversion and DIY campervans. We can even arrange cover for self build conversions during the conversion process provided you finish it and obtain a new V5C showing the correct "Motor Caravan" classification within 90 days.